by George Couros (purchase from Amazon, sign up for Couros’ “The Principal of Change” newsletter, and learn from him on Twitter - @gcouros) *The thoughts in this post merely scratch the surface of the contents of the book. Innovation has been a buzzword in education for quite some time now, but as Dr. George Couros sees it we often don’t have a clear definition of what “innovation” means prior to declaring that we are ‘innovative’. He rightly emphasizes that using technology is not innovation and, argues that we need to question what we do and why, and in this context, we’re talking about what we’re doing in our schools and with education in general. (without limiting the discussion to technology) Couros draws our attention to the visual (on the right) you may have seen before, which is credited to Bill Ferriter (@plugusin), stressing the point. Fixed vs growth Mindsets. Unsurprisingly, Dr. Couros discusses the difference between fixed and growth mindsets, and the need for educators and curriculums to accommodate student failure to foster success. However, he stretches this thinking further, challenging us to move beyond the simple idea that “failure is good”, and explains the need to help learners develop an unwillingness to give up. (in his words, resilience, and grit) *Following Dr. Couros' lead, I'm including several excellent Sylvia Duckworth sketches found in the book and elsewhere. The growth mindset discussion left me questioning what I was doing about my own professional growth: Would I want to be a learner in my own class? Truthfully, not always. How can I challenge myself to be a more innovative teacher? How can I adapt the tools to build better learning? Couros again has a great visual produced by Sylvia Duckworth. 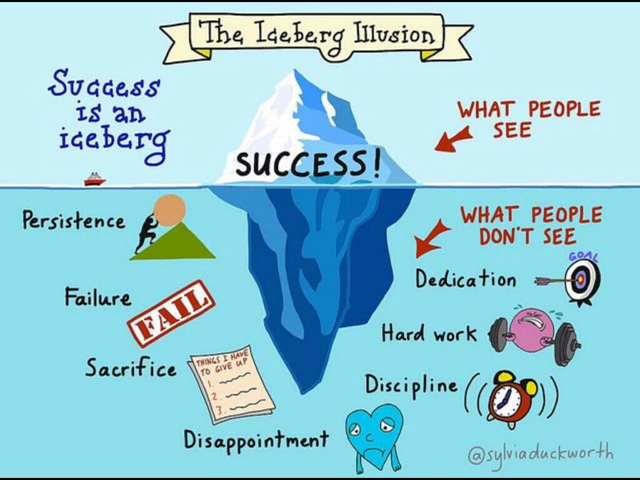 (@sylviaduckworth) See the visual below and a deeper explanation of each of the following characteristics here. See his ideas in more detail here and another Duckworth sketch below. We are all leaders in some capacity. Creating a culture of innovation will require some debate, discussion, and inevitable disagreement. Speaking of cultures, and referencing Devorah Heitner (author of ‘Screenwise: Helping Kids Thrive (and Survive) in Their Digital World’ - see her website Raising Digital Natives for great advice and her highly engaging book) Dr. Couros notes how a culture of compliance in schools limits us in our ability to help students learn to be curious, self-directed, and engaged. Conversely, we can empower our students by allowing them to do things, which will lead to greater engagement. Achieving this kind of environment or school culture has to be a shared vision throughout the process. Leaders should be focusing on the strengths of their constituents to build confidence (by fitting jobs around skill sets), and then work on the weaknesses. This makes complete sense. When leaders ignore their people, their people will be disengaged. (I have personal experience with this, which led me to leave a school and take my skills elsewhere to a place in which I could contribute as well as develop my teaching craft) An incredibly important point is the need to demonstrate a genuine concern for your staff. What are their interests? Their goals? Their hopes for their professional future? A leader likely does not know what their people want and what they are thinking, so they should be asking. Couros notes that, ultimately, leaders must model and mentor. So what should a leader (and a teacher) be looking for in classrooms? See Dr. Couros’ more detailed explanation here and yet another excellent Duckworth visual. intimidated me, but I have clear ideas for improvement. The technology piece comes back into play later in the book, with a philosophy that reminds me of a Google for Education t-shirt I once received which reads “Less tech-ing, more teaching”. I love the statement. (not to mention laughing out loud when I read “Are your school devices really just $1000 pencils?” in the book) It directly suggests that technology are tools, but we need a plan for it. This is what George Couros is saying about technology. He goes deeper to point out that the technology tools available to us today can transform and personalize learning. Schools do need to carefully plan how technology is used, as well as what technology is used. This plan should include finding, developing and celebrating in-house to district level talent to help develop the skill sets of the wider teaching community. Couros goes into greater detail, but essentially, we have to ask ourselves what is best for students and how is learning improved with the technology being employed. In the process, he suggests that leaders allow faculty to seek out and explore tools that may be useful for learning. Moreover, he comes back to an earlier point and reminds us that innovation isn’t limited to technology; we should also be thinking about structures and direction in learning. Dr. Couros leaves us with another great visual (below), this one developed by himself, called The Networked Teacher. You can see it on his website which comes with a detailed explanation of how it can be interpreted. *You can subscribe to Dr. George Couros’ blog "The Principal of Change” at https://georgecouros.ca/. Learn from him on Twitter (@gcouros). I am really glad to glane at this web post which consists of tons of useful information, thanks for providing this data. I really thank you for the valuable info on this great subject and look forward to more great posts. Thanks a lot for enjoying this beauty article with me. delhi top 10 schoolI am appreciating it very much! Looking forward to another great article. Good luck to the author! All the best!